You’re moving house and you have everything covered except one thing—how to move a fridge. That has you baffled–and worried. ‘How do I move a fridge into my new home?’ you wonder. Your fridge is huge—and you’ve heard horror stories from your friends, who ruined their high-end fridge when they tried to move theirs. Fortunately, the expert removalists at Prestige Moving have learned a few tricks over the years and are glad to share them with you. What do I need to do to safely move my fridge? The key to moving a fridge successfully is preparation. Get this part right and you should be able to move it without a hitch. Turn off and disconnect the refrigerator the night before moving day: This gives your evaporator time to defrost. This step is key because if you don’t, you can damage your evaporator during the move. This step also gives the oil and other fluids inside your fridge time enough to settle in place instead of moving through the compressor. If the fridge has an automatic ice maker, disconnect the hose and remove all the ice. This will prevent the kinds of spills and leaks that could cause damage. Remove all the food and disinfect the interior: Eat what you can and give the rest to your neighbours. You’ll want to disinfect it well because once the refrigerator warms up, microbes begin to multiply on uncleaned surfaces. 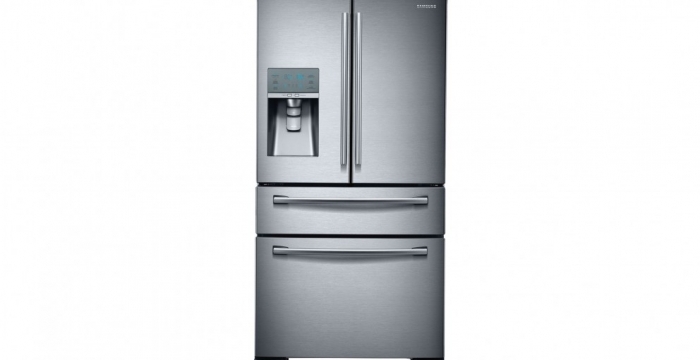 Not only will this cause your fridge to have a musty odour, but it can also contaminate the new food you put inside. Remove the shelving: Your refrigerator’s glass shelving may hold a lot of food, but when it gets jostled around in transit, it can chip or break. To minimise that risk, remove the shelves and wrap each one in a blanket, packing paper, or bubble wrap. Tape the door shut: To keep the door from swinging open and damaging itself or other belongings, tape it shut. Make sure your fridge won’t scratch the floor or its underside: If your refrigerator doesn’t have wheels, you’ll need to use something that will protect it and slide easily underneath it. Find a large piece of cardboard, a sheet, or a sturdy tarp. Rock the fridge gently back and forth, sliding the item underneath the refrigerator. Wrap your fridge in protective wrap and blankets: Make sure you have tough, quality packing wrap that can protect your fridge from the occasional bump that may occur during travel. After you’ve covered it in professional-quality packing wrap, give it double protection by wrapping it in blankets. Tape the blanket to the fridge with sturdy packing tape. Make sure the tape only touches the packing wrap, not the fridge itself, lest it leave an ugly mark. Get it on a trolley and strap it down: If you live alone, recruit a friend for this step—it’s a two-person job. Have one person rock the trolley back, while the other one pushes the refrigerator forwards. Don’t let the refrigerator topple backwards or forward. That can cause oil to travel up the pipework inside. Once you have it on the trolley, fasten it securely with a sturdy strap. For that same reason, it’s best to transport the fridge in an upright position rather than on its side. If you do have to transport it on its side, give it 24 hours in an upright position before you plug it in. Transport your fridge carefully: Make sure you go slowly and carefully as you move your fridge into the moving truck. If you plan to transport it yourself, drive slowly, avoiding tight turns, potholes, or bumpy roads if at all possible. If you don’t want to risk moving your fridge on your own, consider handing the job over to the professionals at Prestige Moving. Our caring removalists will use only the finest moving equipment to pack and transport your refrigerator and other valuable items you’d prefer not to handle on your own. Your fridge—and everything else—we will treat as if it were our own. To learn more about moving speciality items safely, contact the knowledgeable team of removalists at Prestige Moving today.